Where can you go with your BIG Points? Be a BIG Member now to start experiencing the BIG picture with your AirAsia-Citi credit card and redeem for flights with your BIG Points! 1. Only applicable to cardmembers who redeem 3,000 or more BIG Points in a single redemption during their Birthday month. 500 bonus BIG Points will be credited into cardmember's BIG Member ID by 15th of the following month. 2. Date of birth provided in BIG Member ID's application must match with Citibank's records for fulfilment purposes. 3. 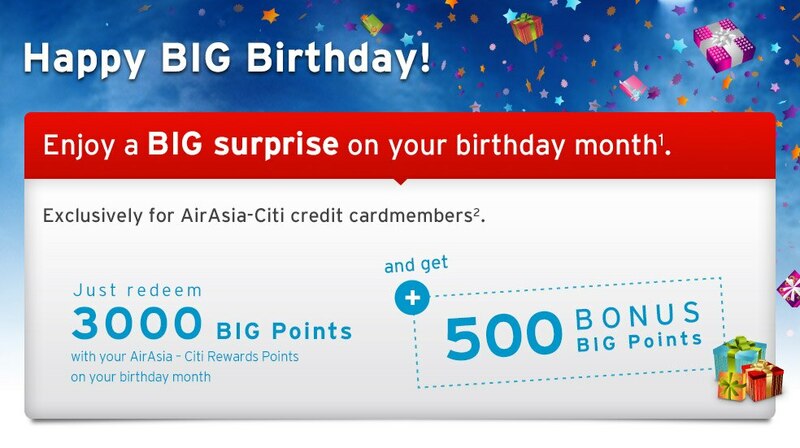 The term BIG Member/ BIG Shot refers to an AirAsia global loyalty program member.